3. Enoch: A Pleasing Walk with God. Hebrews 11:5-6– By faith, Enoch was taken up not seeing death, and was not found because God took him, for before he was taken up he had been proven that he had been pleasing to God. Now without faith it is impossible to be pleasing, for the one coming after God must believe that He is, and He becomes the rewarder of those who seek Him out. The notion that Faith can cause a person to escape death is not uncommon. Is it not the faith-healings which revive the terminally ill and set them on the path to wellness again? My father, a chaplain for Hospice has seen many a peaceful transition from this life to eternal life as people “fall asleep” when they die. The point of this post however is not faith’s power in the face of death, but rather what entails for the living. Jesus said, “Follow me.” and when he picked his twelve disciples he picked them “that they might be with him.” The awesome privilege of faith is first and foremost getting to be with God, to walk with him, to be in His presence, to know the pleasantness of His company. But He keeps moving, and so you must keep moving to go with him, and let no care of the world slow you down or keep you back. “Enoch walked with God.” (Genesis 5) That means He kept step with God, and God was with him. Both were glad to be with one another. Enoch did not have anything written about him except he had a son named Methuselah, and he walked with God. This walking with God, is seen in the Greek verb “to come after, to come toward, to go after.” This is less intense than a pursuit, but it is as complete as a living relationship in the world. This is the life of faith. The agnostic and the atheist are really alike in this respect: they lack faith in God’s existence. One may say that God doesn’t exist and they’re sure, the other just says they are not sure that God is. Both are the lack of faith of one who does not trust God enough to go after him. Usually, it is in response to the way their world has been presented, or things in their world that seem too big or unthinkable to believe that an Unseen God could exist, and many still more believe that the God who is presented by those who claim to know Him is not a God worth believing in. difficulty the visible tangilbe reality entails. This takes such a trust, such a surrender of one’s own right to judge God, such a willingness to obey the Good King against whom all of Humanity has set its rebellion and hold visible reality with an open hand for God to make clear. He is the Rewarder of those Seeking Him out. I have spoken to some who have said “I’ve looked for God and not found him.” Or others, “I’ve tried Jesus, and he didn’t work for me.” There are two wrong beliefs behind a search for God that ends up fruitless. 1. You have not yet accepted the reality that God is real. Any search for God starts with this. 2. You doubt your capacity or your worthiness to be rewarded by God if you seek him out. This one is harder to shake, because it is usually based in what other people have said to you, or things you have said to yourself that you have accepted about yourself as truth. If you remain in a state where you will choose to listen to yourself or other human beings before you will listen to God, then your present faith will not save you. You have already made your choice to listen to someone else, and have settled for your cell in Satan’s dungeon. Furthermore, keep in mind if you want to seek God out, you must know what it will cost you. No one going after God can get there with an eye to get human recognition or reward. In the Theological Dictionary of the New Testament, this is written about the concept of Reward as far as following Jesus is concerned. “The distinctiveness of the divine reward is so radical, however, that if a man seeks human recognition and earthly gain for his acts he thereby forfeits the acceptance which God wills to grant him in the [reward].” ~TDNT p 699. The path to finding God is a glory-less one as far as the eyes of man are concerned. The only way to live a life of faith is free from the sought rewards of man: fame, wealth, achievement, power, self-actualization. The reward is God Himself, friendship with Him is the sweetest reward that God gives to the one who walks with him. 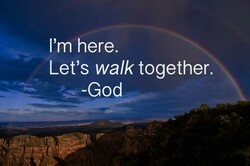 Ask for the privilege to walk with God. Join Him in His work.